Our RING OF FIRE Band is a Florida Space Coast 6-piece band headquartered in Melbourne, Florida, on the Atantic coast about 25 miles south of Cape Canaveral. We perform a variety of genres, including Classic Country / Rockabilly cover songs. We LOVE the music of Willie, Waylon, Haggard, Jones, Cash, Kristofferson, Hank, Lefty, Chuck Berry, Johnny Rivers, Bobby Bare, Gene Watson, George Strait, John Denver, and Jimmy Buffett - just to name a few! --Kevin Kimbro (Gene's son) - Young Musical Ace: Lead Guitar, Mandolin, Bass, Drums, Fiddle, Keys, Vocals! --Mary Kate Brennan - Wonderful young COUNTRY Lead & Harmony Vocalist/Rhythm Guitar! --Don Sadler: Great Space Coast Fiddler/Harmonica/Guitar/Lap Steel/Vocalist! --Ray Byrd: Pedal Steel Guitar, PRO band/radio show veteran, FINEST Country Steel player I know of in Florida! --Mike Hart: Super PRO Space Coast Drummer! --Art Edwards: Wonderful, skillful PRO Space Coast seasoned Bassman often with us at bookings. A great friend of the band! --Mike Minski: Well-known Space Coast live music PRO Bassman (great friend often with us at jams and gigs). --Bob Davis: Rhythm Guitar/Lead Vocals/Songwriter member of Broadcast Music Inc. (BMI), Harris Corp. Sr. Scientist, Research & Development Electrical Engineer in the Advanced Technology Department (ATD), Retired. 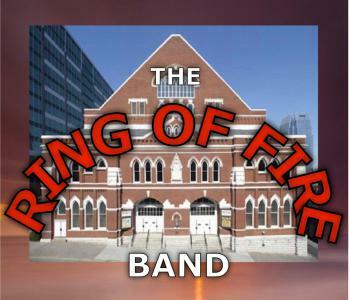 SAMPLE SONGS PERFORMED BY THE RING OF FIRE Band. All these songs were recorded locally in Gene Kimbro's Famous ROUND TABLE RECORDING STUDIO in a session engineered by Boyd Morgan. -FOLSOM PRISON BLUES (Johnny Cash) Often, our first vocal in the first set. (Located in the METRO WEST shopping center at the NE quadrant of the Wickham Rd / New Haven Ave (US192) intersection. Storefront faces closest to New Haven Ave.
NOTICE! When the RING of FIRE Band has no booking Friday thru Sunday for the weekend, it often hosts its WSM OPRY, a popular FREE open-mike Classic Country/Rockabilly PUBLIC Jam on SATURDAY afternoon from 2-5pm at the Wholesale Music Store. Frequently, most ALL of our RING of FIRE Band members are present to support this Jam. All Pickers and Grinners are certainly WELCOME! The content of this Space Coast Live website for our RING OF FIRE Band is controlled by Bandmaster Gene Kimbro, and maintained by band member Bob Davis. If you have comments, corrections, suggestions for the site, please contact Bob at Cell: 321-501-2736, OR Email him at: RCD@CFL.RR.COM. -MANY details about our Band. NOTE: On the following links, keep clicking on any Show More link at the bottom of each listing to see ALL the listed events.